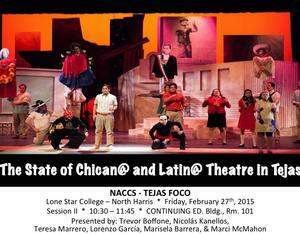 On behalf of Lone Star College-North Harris I want to invite you to attend the Tejas Foco 2015 in Houston, Texas-the 4th largest city in America. Texas is poised to become the leader in shaping a multicultural, multimedia educational system for our community. We have entered an era where all the tactics our culture once used to survive will now help us to thrive. Houston and Lone Star College represent that mix of energy, community, and resources that can deliver us to that. I look forward to serving the members of the Tejas Foco and the constituency it represents by offering them everything the Bayou City has to offer." 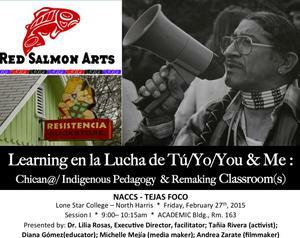 Tony Diaz, El Librotraficante, Director of Cultural Intitiatives Lone Star College-North Harris. 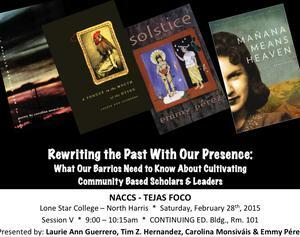 2015 Tejas Foco Conference Schedule.